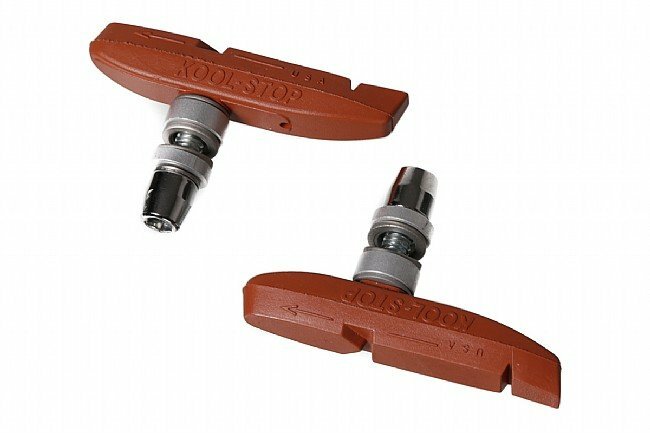 The aggressive Salmon compound used in these Kool Stop Supra 2 Brake Pads make them easy on rims while providing superb wet weather performance. The contact surface features grooves to channel out water and debris, while the backing is made from reinforced hardened steel to make a rigid platform for the best manipulation. Raised ends allow for a self towing-in design, and the threaded studs with Knurl-lock™ washer system are compatible with many V-brake and caliper designs.